Today we celebrate the feast of Pope St. Pius X.
St. Pius X said in his first encyclical that his papacy would seek to "to renew all things in Christ." He is primarily remembered for allowing children to receive First Holy Communion at a much younger age. They are now allowed to receive Our Lord at the age of 7 instead of 12 to 14. He said, "Holy Communion is the shortest and safest way to Heaven." In fact, he also encouraged frequent, and even daily, reception of Holy Communion. He is also remembered for reforming the liturgy, promoting clear and simple sermons, bringing back the Gregorian Chant, encouraging daily Bible reading, and taking a stand against Modernism, which he called "the summation of all heresies." 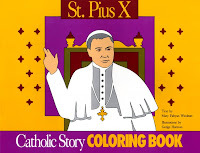 This morning I read about St. Pius X to the children, while they colored pictures of him, from one of the great Catholic Story Coloring Books. Marci had a fun day planned in his honor, since today would have been the next Summer with the Saints, but she isn't feeling well so she had to cancel. (We hope you feel better soon Marci!!) She did ask me to stop by her home to pick up some of the craft supplies and snacks on our way home from swimming, so we just might be doing a craft tonight! She really has been spoiling us!! 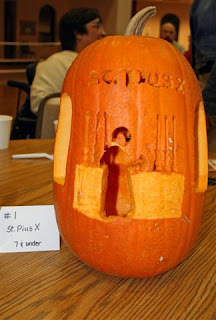 Here are a few pictures of Captain's "St. Pius X" Saint-o-Lantern that same year. 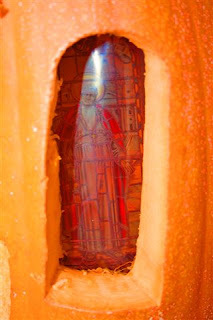 It was a tall order, but I think daddy did an excellent job "helping" Captain carve it... Stained glass windows and all! In fact, they won 1st Place that year! Anyhow, reading about St. Pius X triggered all my children to discuss which Saint they want to be THIS year!! I can't believe it is only 2 months away! Time to start planning! Holy cow! Captain has a great costume. 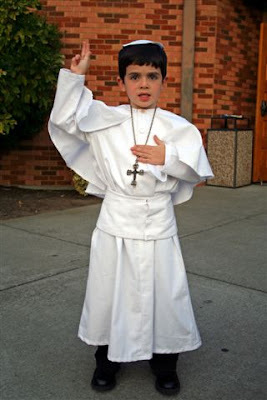 Morgan just walked up behind me, looked at the computer screen, and said, "why is that boy dressed up like Pope Benedict?" This was a good teaching moment. Great entry! Pope Benedict! I have a feeling Morgan was not the only one who thinks Joseph Ratzinger (Benedict) has a facial resemblence to Joseph Sarto. 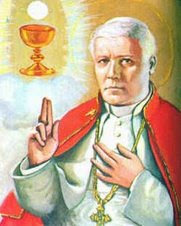 (St. Pius X) Do you know they were the only two popes to ever have the baptismal name of Joe? Joe the Pope!